While it’s no secret that a stock plan will cost less up front, a well thought-out custom design may be cheaper in the long run. It all depends on your needs and your site. In the world of custom-home design, building with a stock plan exactly as purchased hardly ever happens. And while it’s no secret that a stock plan will cost less up front, a well thought-out custom design may be cheaper in the long run, according to Ty Allen, who heads the East Coast design group for New Energy Works Timber Frame Homes, a custom timber company. Buyers who opt for custom homes may be able to get what they need with less square footage, which is usually the most important factor in determining total building costs, he adds. Also, the house can be tailored exactly to the site. Designers can take into account the views, the slope of the lot, wind, solar orientation and other factors that a stock plan, by definition, can’t. If you’re hesitant about designing from scratch, or simply don’t need the high level of customization in your home’s layout, there’s always the option of working off a stock plan. Many companies offer timber-frame packages based on a variety of stock plans, as well as custom design services. Often, buyers choose to go stock and then pay only for changes they really find necessary. The easiest way to purchase a stock plan is to buy one from a plan book or a timber home producer without making any changes to it. Most timber home producers carry a large selection of stock plans from which to choose. 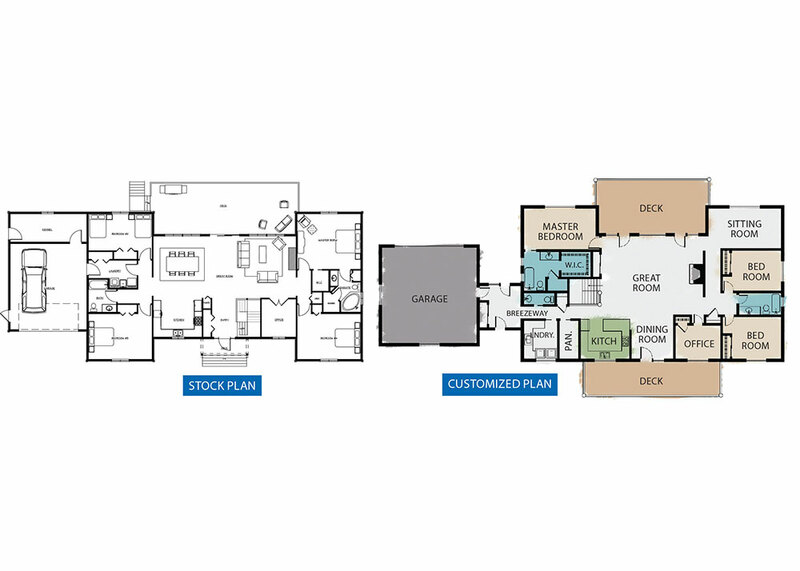 Hundreds of plans sortable by square footage are also available at timberhomeliving.com/floorplans.